X-Large - $93.99 Only 7 left! Are you ready to be everybody’s favorite cowpoke? We know what you’re thinking. “But guys, it’s impossible to shrink down to toy-size and become Andy’s favorite toy.” Well, that’s where you’re wrong! Maybe not about the whole shrinking down part but about becoming the one and only Sheriff Woody. 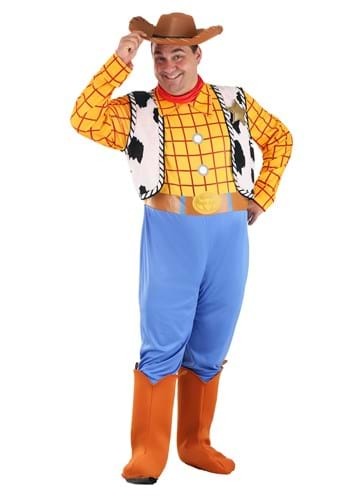 All you need is this amazing Adult Woody Costume and your adventure can begin! If you’re ready to bring the classic Disney and Pixar movie Toy Story to life this Halloween then do it the right way. Take on the lead role of Woody and show everyone how this sheriff gets down on the dance floor. Everyone may think that since you’re a man of the law you may be a bit stiff. But those are the people who forget that you happen to best friends with a space ranger! Buzz Lightyear may be serious when the time calls for his professionalism but still, he is one spaceman with some futuristic dance moves. And you can believe that he taught his best friend Woody these awesome space-age moves! So pop on this awesome western-styled jumpsuit and the included accessories, and show everybody how the toys party when Andy’s gone! Find a handful of friends to dress up as Buzz, Bo Peep, Jessie, and the rest of the zany characters from the famous franchise. You can give the rest of the party a blast to the past this Halloween when you walk in dressed up as these Disney classics. Just make sure to check your boots for snakes, those slithering creeps just love hiding in boots!